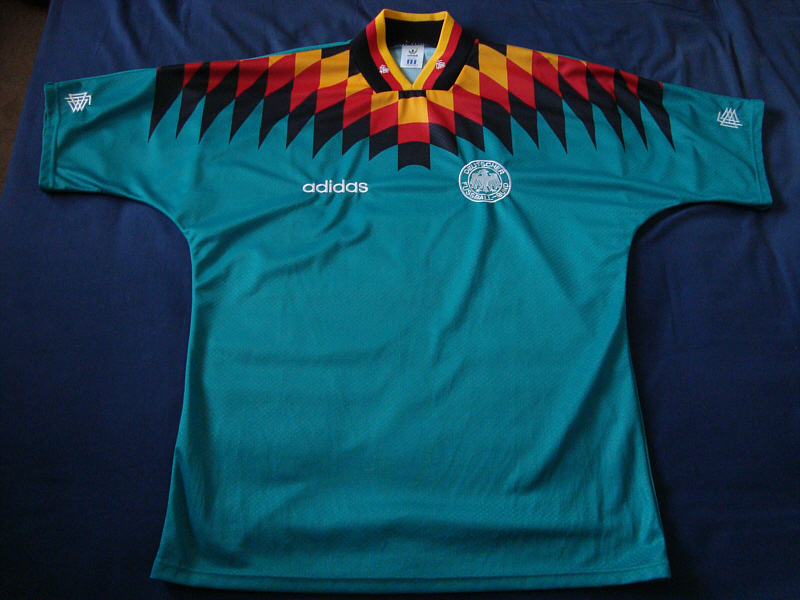 In time for the 1994 FIFA World Cup finals in the United States came a new design that went hell for leather in its incorporation of the national colours. 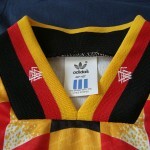 The shirt featured a series of squares in black, red and gold – the reason for my calling it the “chess board”. 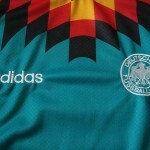 According to other sources the shirt design was meant to symbolise an eagle in flight – something that one can only see if one stands still with both arms outstretched. This shirt has been described by purists as one of the most gaudy designs ever created for the Nationalelf; while they certainly have a point, the design does grow on you after a while. 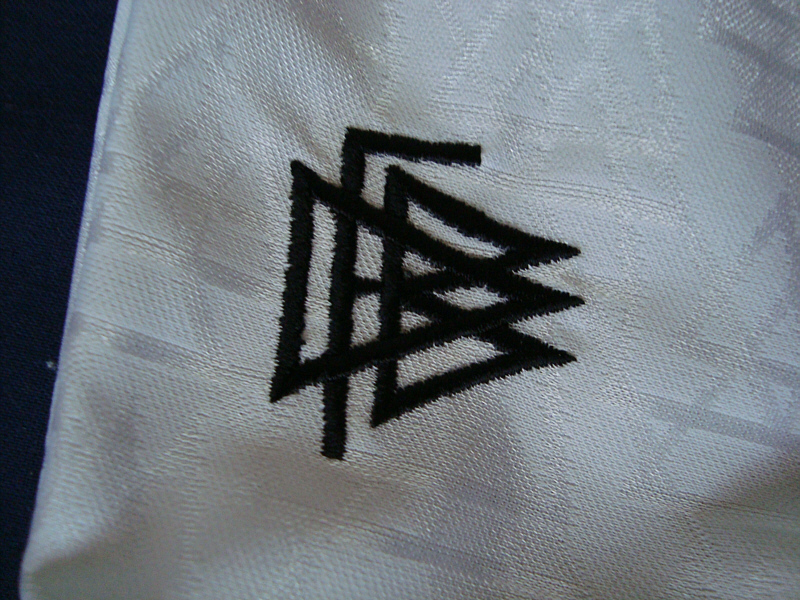 Even the usually plain black shorts were redesigned to incorporate this new design. 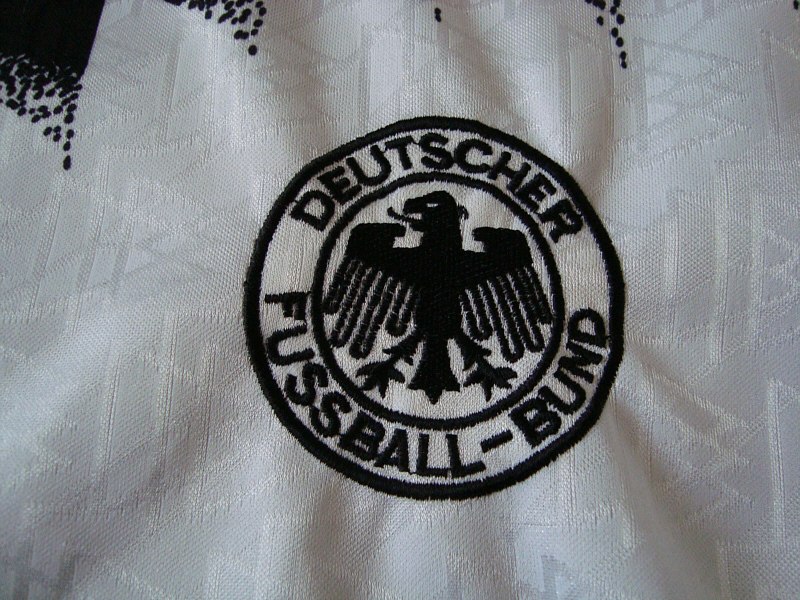 The elaborate design of the white home shirt proved that the days of the generic garment being rebadged was well and truly over; like its predecessor it was also “watermarked”, but with a recurring stylised DFB logo. 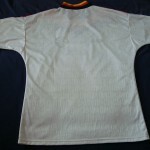 The “chess board” (or “eagle”, whatever you choose) design appeared only on the front of the shirt, and covered the shoulder area; each square had what could best be described as a “spraypainted” look. 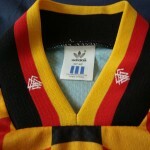 The v-neck was in Schwarz-Rot-Gold, with two small DFB logos woven in white thread. 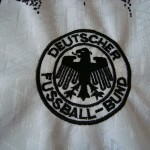 The DFB logo was also applied to each sleeve, and was neatly woven in black thread. 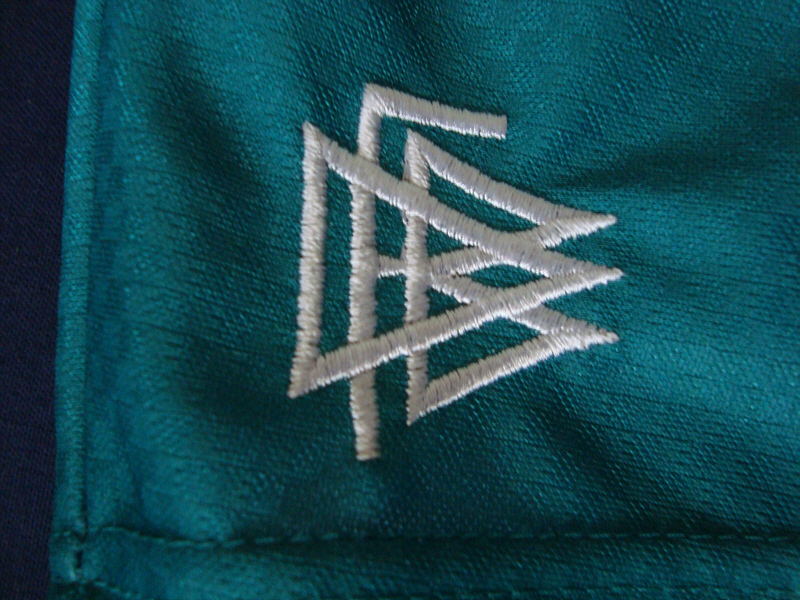 The “Adidas equipment” logo that had appeared in the 1992 shirt was replaced by a woven “adidas” in large lettering which appeared on the right breast (left in the photos), and was situated opposite the national eagle; Both of these features were machine-woven in white/silver thread. 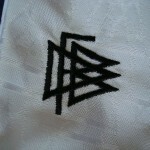 The white shirt was worn with black shorts, which unlike the previous plain black versions carried the same “chessboard” design that cut across the corner on the left leg. 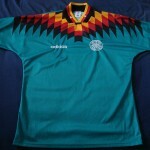 It was admittedly rather ugly, and smacked of design overkill. 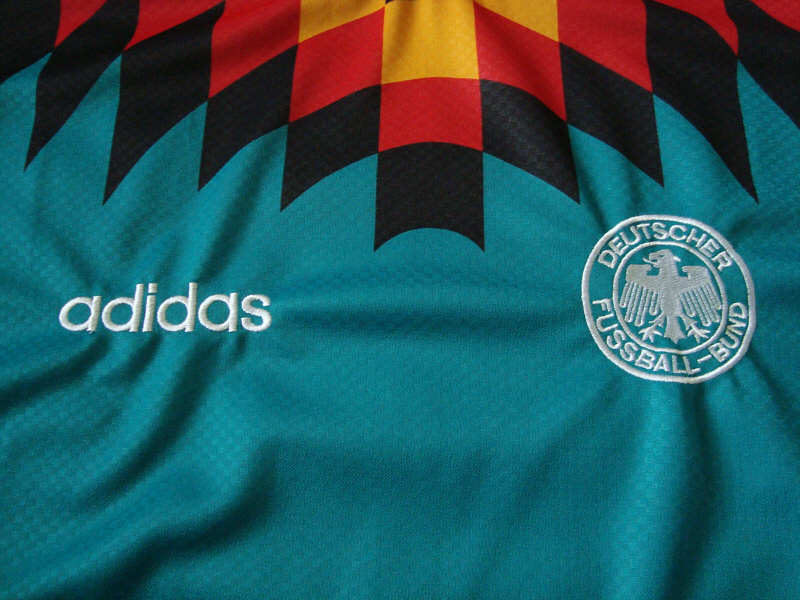 The elaborately-designed shirt would have contrasted far better with the good old-fashioned plain black shorts, as had been the case with the classic “flag” design of 1987-1992. 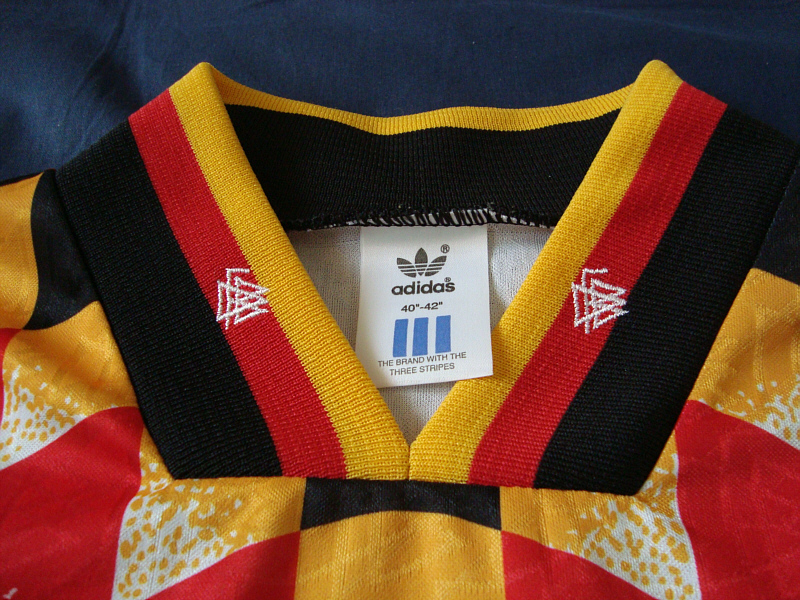 The white socks were also changed slightly: instead of simple black, the three Adidas trademark stripes were in Schwarz-Rot-Gold. 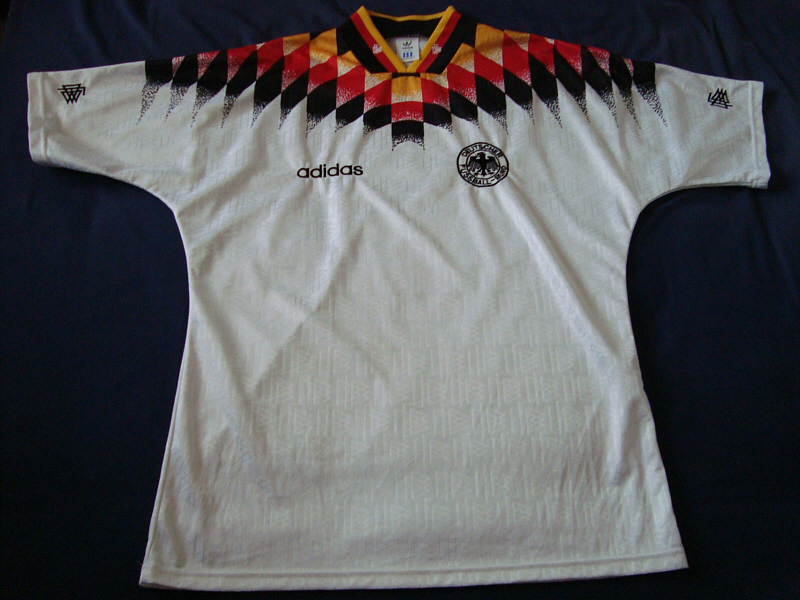 The moment I would most associate with this shirt is not a good one: namely, my twenty-third birthday and the quarter-final when Bundesberti’s squad were knocked out by a balding Bulgarian. 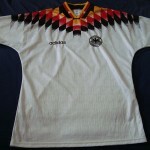 If were to associate one particular player with this shirt, it would perhaps again be Jürgen Klinsmann, who scored five goals during the tournament including a cracker against the perenially “plucky” South Koreans. 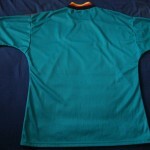 The second shirt was again of identical design, though in a teal green. 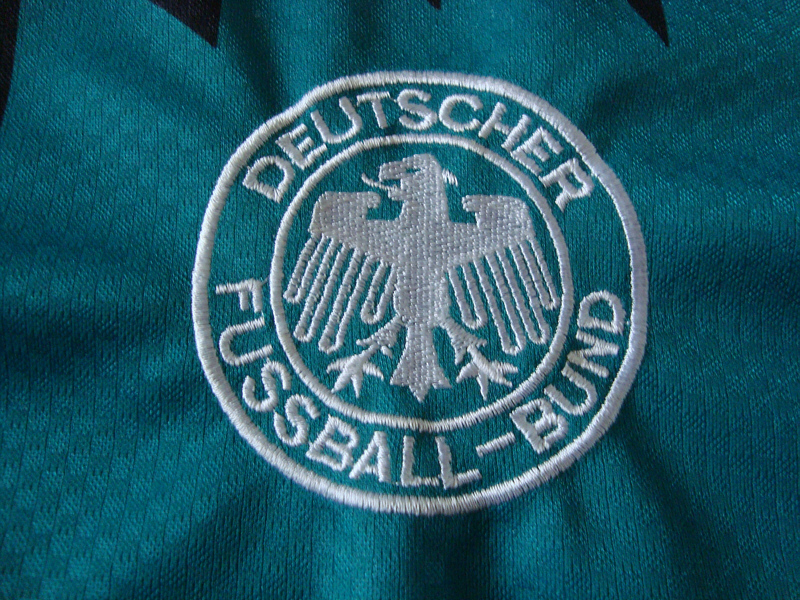 There were a few slight differences: the watermark was not the recurring DFB logo but tiny squares that gave the shirt an unique appearance when it caught the sun at a particular angle, and the “chess board”/”eagle” design consisted of sold blocks of colour as opposed to the “spray painted” effect. 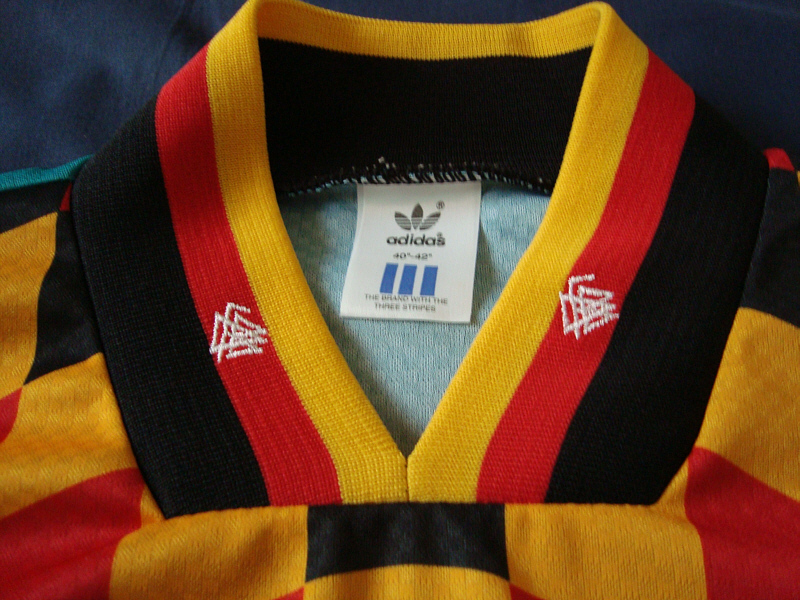 The design and colour of the v-neck was exactly the same as the white shirt, but the “adidas” lettering, national eagle and DFB logos on the sleeves were all woven in white/silver thread. 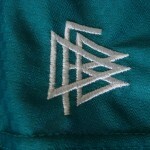 Unlike the home kit, the shorts and socks for the green second kit were left unchanged – plain white shorts, and green socks with three white stripes at the top. 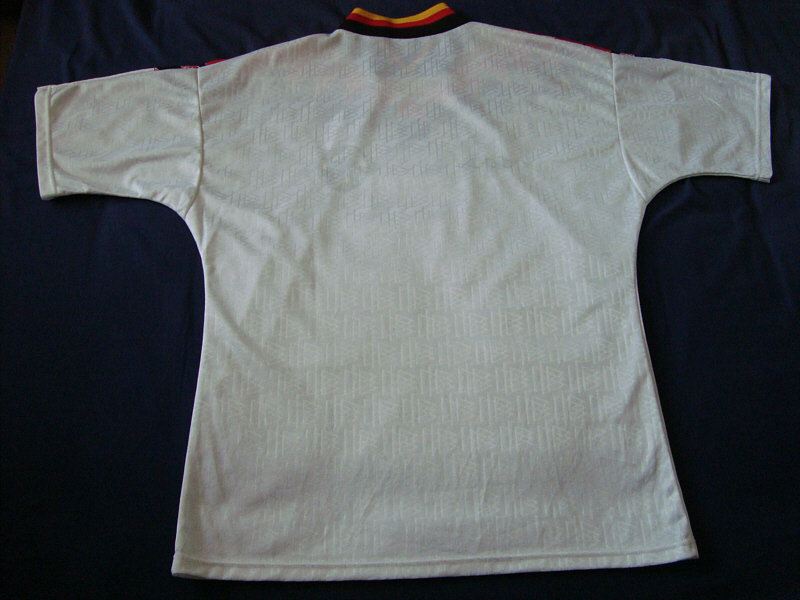 Not many games were played in this shirt, but the biggest memory I have of it is another negative one involving those fellows from Bulgaria, and Hristo Stoichkov in particular. 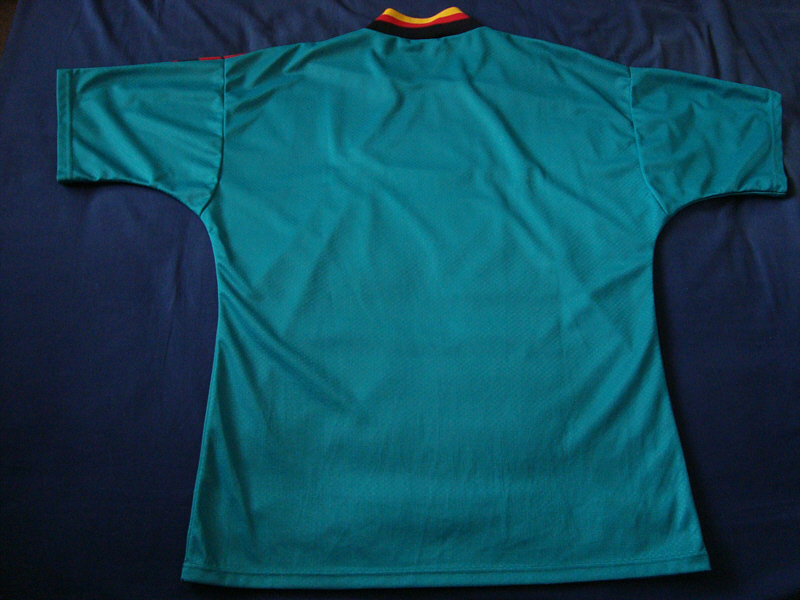 This time it was a qualifier for Euro ’96 in Sofia, when the Bulgarians came back from 2-0 down to win 3-2, helped in part by a couple of suspect penalty decisions. It is difficult to associate one particular player with this Trikot, but on account of his goal against the Bulgarians I’d plump for Bayern’s midfield rock Thomas Strunz. 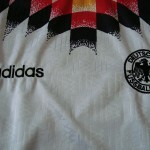 White: v Italy, 23.03.1994, Stuttgart. 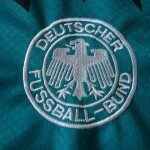 Green: v Bulgaria, 07.06.1995, Sofia. 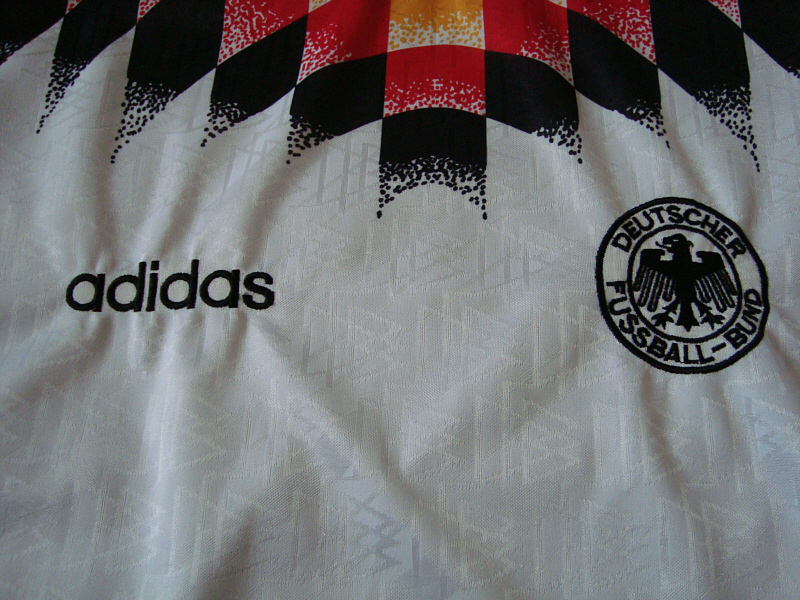 My favourite German shirt design. I’ve seen people complaining about it before, and I can never understand why. It’s the best!